The Bartlett Lake Olympic Triathlon is fun. It's challenging. It's scenic. It's more intimate than the larger races. If you ever get the hankering for a triathlon course that will beat you to death and make you enjoy it - this is your course. It compares very well to the Mountain Man 70.3 in Flagstaff. 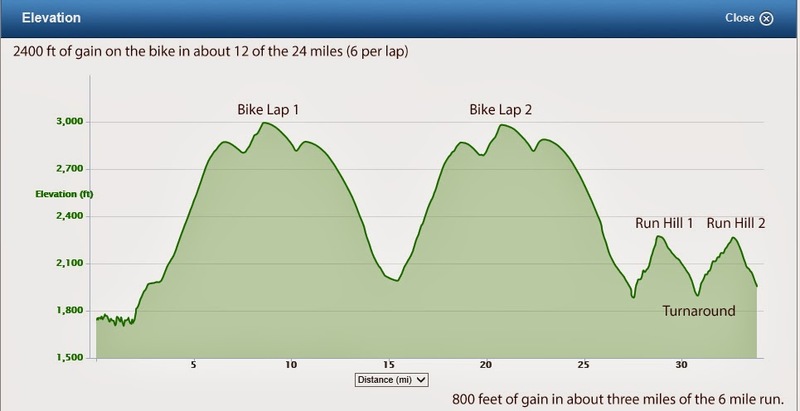 It actually may be a little tougher than the 70.3 in Flagstaff ... which is amazing considering it is only an Olympic. In October 2011, I did Bartlett as my first ever Olympic triathlon. I wrote up a race report for that day. Upon re-reading that post, I could not be more pleased with my performance from yesterday. It was like two different triathletes. In fairness, the last time I did this course I had much less experience in the sport. I slept about an hour the night before the race. I have a huge web project with a compressed timeline ... and Carrie and I worked all weekend on that beast. I admit I was not as "jazzed" about racing until about an hour before the start. The energy consumed me. I hadn't raced since October 2013 and I guess it was time to get back out there. The water temperature was perfect for me. I have a little extra insulation than some of these 5% body fat racers. I think it was about 60 degrees. The water would have been just like the pre-race water at St. George in 2012 if it were a little cleaner. The swim is tough at Bartlett because you swim right into the 8am desert sun. Just as I was calculating my turn to get the second buoy, I ran ashore on some sharp desert granite. I was 25 feet from the shore - but this rock was only about 6 inches submerged. I hopped up on it and dove out into the water and kept swimming. I did the same thing on lap 3, because I liked the extra momentum it gave me. I swam the short 1500m in 31:01 - which includes a barefoot and 6% incline run up sharp and weathered pavement. My previous best swim on this course was 39:05. My transition went pretty well considering this was the first wetsuit race I have done since Ironman Arizona in 2012. On the bike, my first lap was really quite good. The last time I did Bartlett, I struggled for a long while on the bike calming down my legs from the swim. I kept the pace around 9 or 10 mph on the uphill. Speaking of uphill - here's the course. The course is either up or down. There is literally no flat ground after you leave the beach. It's pretty rad! On the second lap of the bike, I was torn between ripping it up OR conserving some for the run. I settled in right between those two and raced a very smart race. I hydrated. I kept nutrition flowing. At times all I could hear was my breathing and the wind. It was a bit windy and dangerous on the downhill of the bike. I did reach 52.7 MPH on the down on each lap. At one point I passed a truck pulling a boat. That's always fun to pass a vehicle on a bike. I was consistent all day. My bike has been mechanically sound and reliable for over a year now. Yesterday was no exception. I biked the 24.6 miles in 1:44:00. 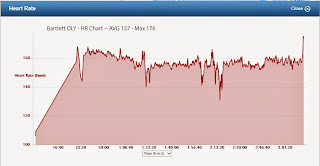 In 2011, I had much more cycling in my training - and I was still faster this year. I think that is about a 14.4 mph average. On this course, that is very acceptable. Time for the run. I knew the run would go better this year than it did in 2011. I have much more running experience now. After Pikes Peak, no uphill run frightens me. I conserved on the first uphill out of transition. It is serious. I think it goes 10% in places. At mile 1.3 it becomes a downhill course. I blasted those two miles time-wise without killing myself for the return uphill trip. At the finish, I ran down a fellow and almost ran down another. I still had gas in the tank. Last time around I was gassed at the beginning of the run. I ran a 59:20 for the 6.4 miles. In 2011, I ran it in 1:17. I am thrilled about that improvement. Did I race this time? I guess I did. Or at least my heart thought I was racing. This course is my favorite course ... which is a big deal considering it is an Olympic and it is stacked against me. For you two that read my stuff - you may remember me whining at times about my feet. Especially my right foot. The dull pain was always on the ball of my foot. The foot doctor once told me it was sesamoiditis. While I believe that is the result of the issue, I was forever in search of the fix. I am a problem solver by nature. On this one, I was neither fast or efficient but I think I may have gotten on track to correct the issue(s). Let me describe the issue: It feels like a giant blister is appearing during both the bike and the run. I've had real "hot spots" before and this sesamoid stuff feels just like that. Yes, my right big toe is not as limber as it once was - and is drastically less limber than my left big toe. During the process, I did get some relief from yoga. I have tried different shoes, different socks, no socks, extra socks, tape, chamois butter, time off from running, extra time running, sprints, slow jogs, metatarsal pads (which do help some), rigorous foam rolling and most recently ultrasound therapy (which helped quite a bit too). About two weeks back I read an article somewhere about this issue and the author recommended a simple solution to my 2+ year dilemma. "Your shoes could be tied too tight. Loosen them up, put some lube on the balls of your feet, wear thin socks and run pain-free." I've run four or five times and ridden quite a bit since the adjustment. So far, that seems to have been my problem. Bartlett Lake Olympic on Sunday. I completed this course as my first ever Olympic. That was back in the fall of 2011. I was much younger then and had much lower miles - but I am hoping the 2+ years of racing since then will factor into some improvement.